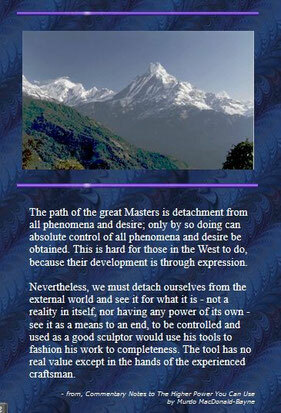 The path of the great Masters is detachment from all phenomena and desire; only by so doing can absolute control of all phenomena and desire be obtained. This is hard for those in the West to do, because their development is through expression. Nevertheless, we must detach ourselves from the external world and see it for what it is - not a reality in itself, nor having any power of its own - see it as a means to an end, to be controlled and used as a good sculptor would use his tools to fashion his work to completeness. The tool has no real value except in the hands of the experienced craftsman.